Looking back at our cycling experience in South America, Bolivia has definitely been one of the highlights. Why? The main reason is probably because it wasn’t ‘easy’. The altitude, the rough roads, the lack of hygiene all meant we had to work hard in this country. And I’ve said this many times before, but the toughest moments are the ones I remember best, make me the proudest and become the highlights of our cycling adventure. 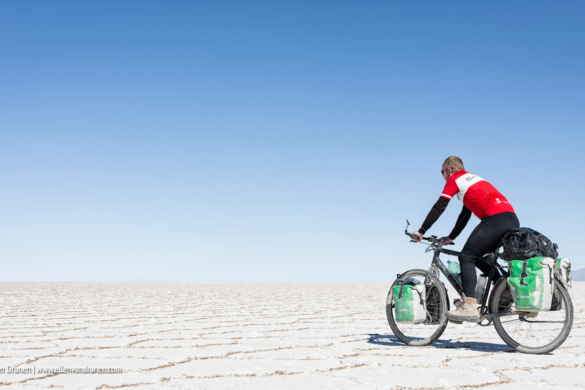 Enough said, just go cycling in Bolivia and don’t miss out on these 5 highlights. 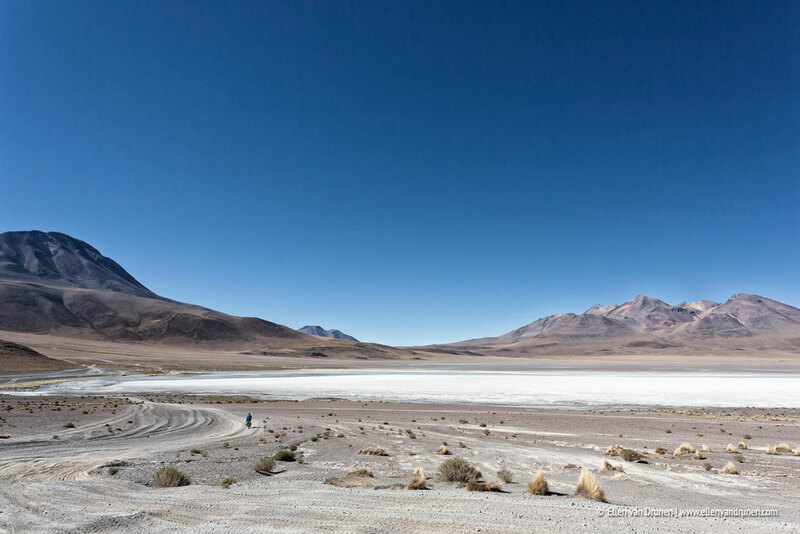 We entered Bolivia in the South West and we felt like leaving the Western world behind us. It started at the border, I felt sorry for these guys sitting in a cold tiny stone building at an altitude of more than 4500 meters. But, my oh my, the view they had must have made up for a lot of things, I hope! And for us reason #1 started at their doorstep. The road from San Pedro de Atacama (Chile) to San Juan (Bolivia) is about 350 kilometers long, the average altitude somewhere between 4000 and 4800 meter, there are sections where you have to push your bicycle through deep sand for more than a few kilometers, it can be freezing cold (-21 degrees Celsius), you may encounter fierce headwinds and this quest may take up to 10 days. Already inspired? Maybe this will help! Red, green- and blue colored salt lakes, filled with flamingos. Very colorful, mineral rich mountains, white peaked vulcanos, deep blue skies, red sandy desert, strange rock formations; it must be the moon! 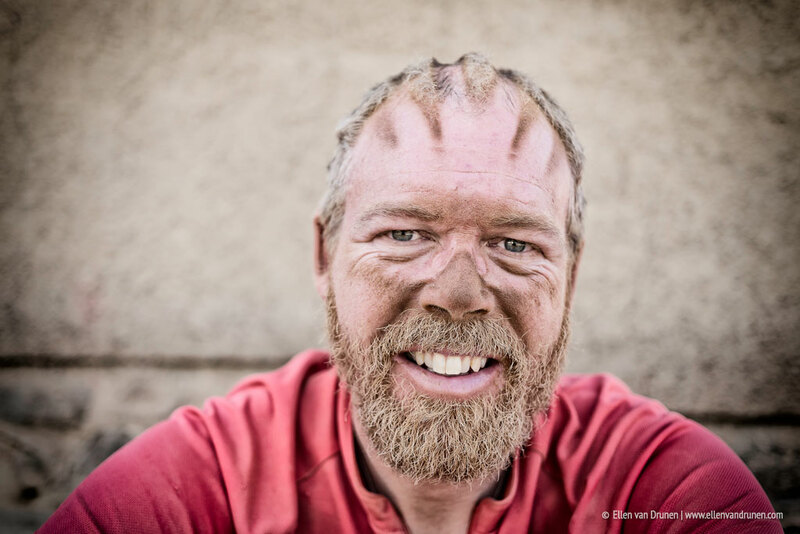 Your mind will play tricks on you, you think you’re going nuts, you don’t want to be there and yet you feel like you’re in bicycle touring heaven. I fell in love with South West Bolivia the first time I was here and never thought we were able to ride our bikes here; we came, we saw and we conquered. 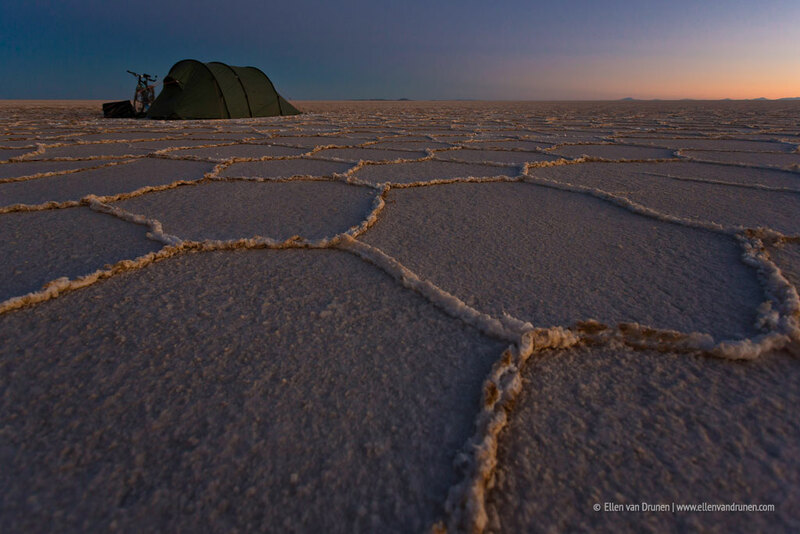 On your way to Uyuni (coming from the Laguna Route), you definitely must cross the Salar de Uyuni; not only should you cycle the crisp and endless salt flat, but make sure to camp here too! (Do bring a rock just before you enter the Salar – for the tent pegs). 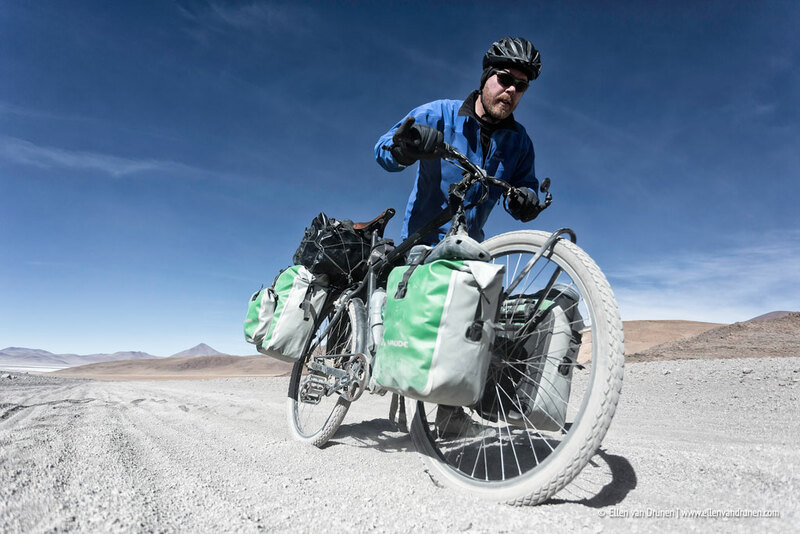 The sunset on the Salar is amazing and cycling the Salar itself is a memorable experience. Whereever you look, whereever you go; it’s white! And don’t forget to take one of those funny pictures! #3 There’s always a party! 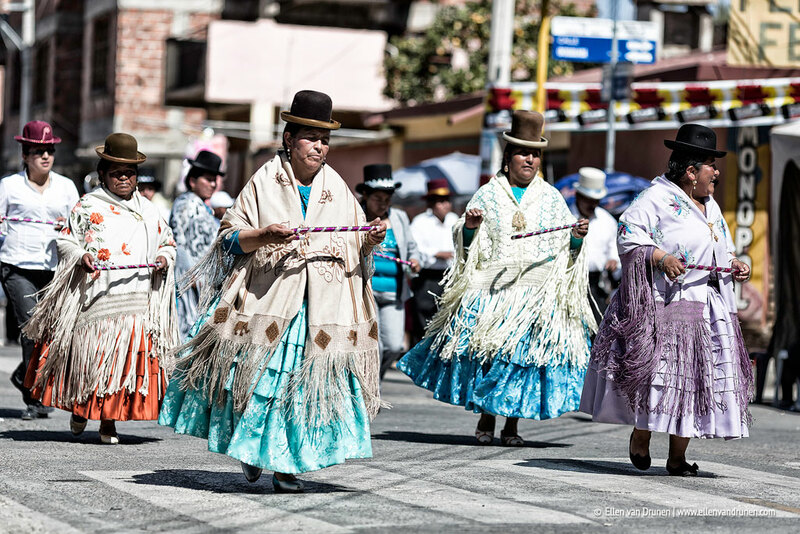 The Bolivian people love their music and their parties. Every little village we passed was buzzing with music and colorful people. The clothes they wear are beautiful and the smiles are priceless; no doubt you run into a party or two. Just sit back and enjoy. #4 It’s mostly unpaved! What more do you want? Bolivia probably has some of the worst roads; dusty, rocky, sandy, muddy and oh, don’t forget the cobblestones! Yes, that’s right; main roads between big cities are terrible! And like I said before, we have a fetish for the tough rides and that’s why we had so much fun cycling here. 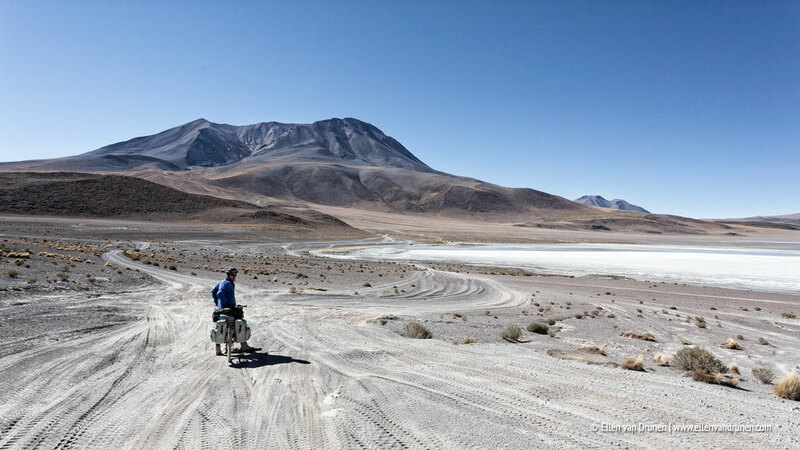 We just like unpaved mountainous rides, feels more adventurous and Bolivia has a lot to offer here. 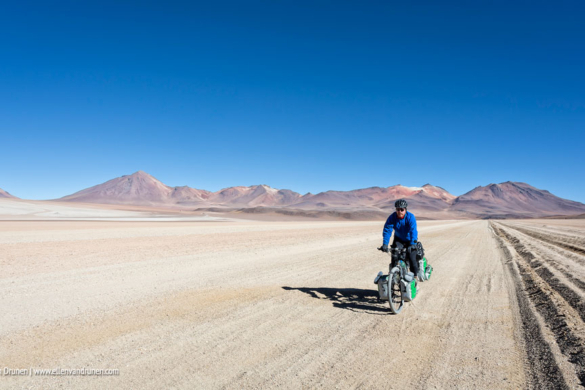 So, if you are into some great offroad trips, go cycling in Bolivia! 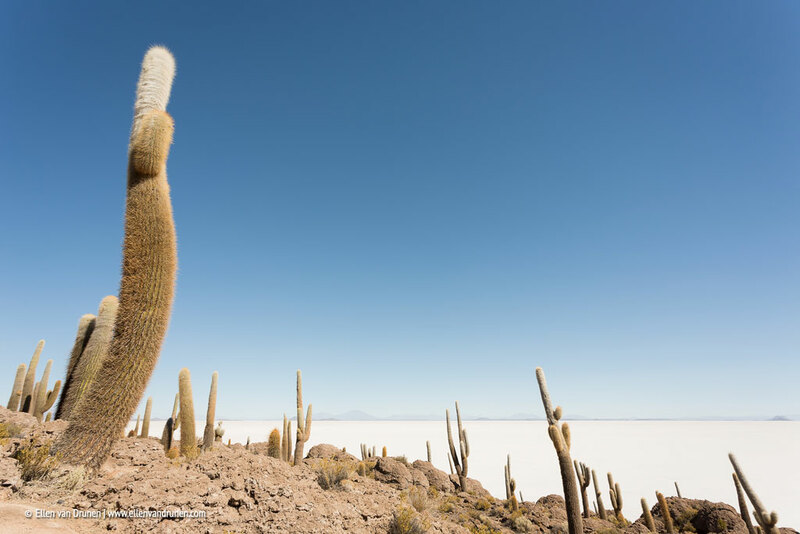 Maybe a bit of a tourist trap, but it’s one of those ‘must see’ and interesting things in Bolivia. After visiting the narrow and terrifying mine shafts, the steep ride up to Potosi seemed like peanuts. It was fun in the beginning, but claustrophobic at the end.. I was glad we left the mine and glad we did visit it. 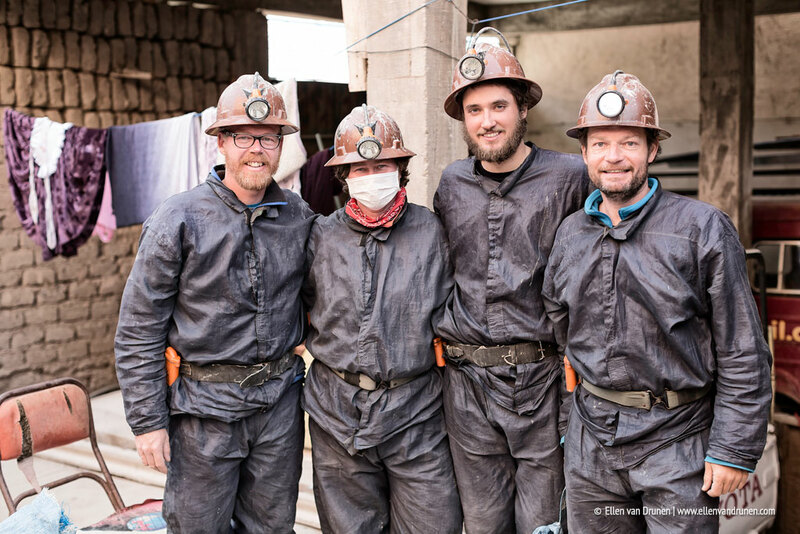 As a thank you we gave a few miners a bottle of soda, a bag of coca leaves and some dynamite, this enables them to keep finding silver. And where else can you do something like this? 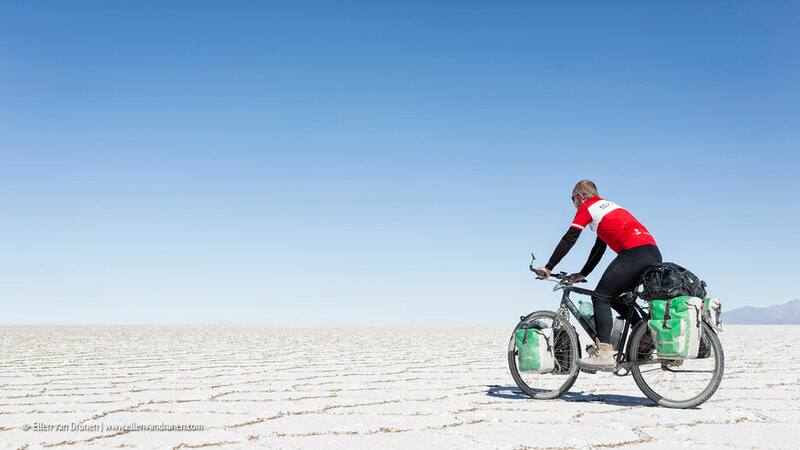 Any thoughts on cycling in Bolivia? Maybe the (in)famous Death Road to Coroico? Or Titicaca Lake? Let us know your experience to inspire other cyclists by leaving a comment below. Beautiful photo’s. Clearly written. 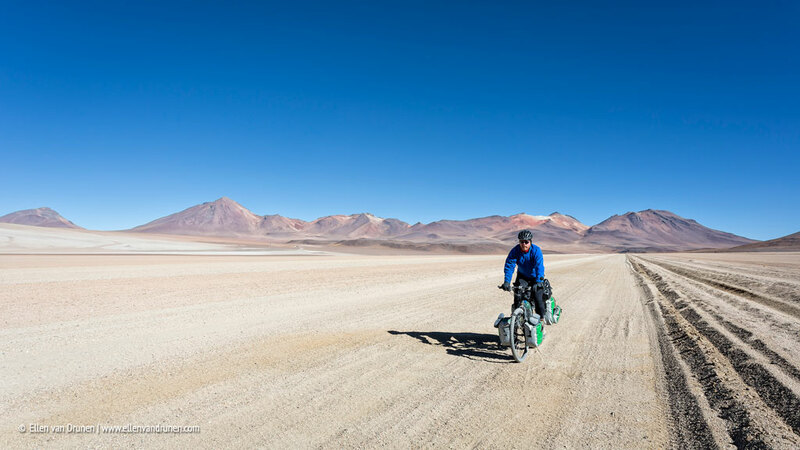 Bolivia on bicycle is high on my list and after seeing these pictures even more so! Tough. Hard. Sandy. Rocky. Beautiful. Good cocktail for a favorite cycling place indeed! Thanks! And you are welcome. 😉 We loved Bolivia, our next top 5 will be on Peru and that country has been a real highlight for us. Happy travels!